Gender can be a very hot-button topic (ahem, understatement). So can Religion. It’s not surprising that discussions of gender roles in Judaism can get very heated. I’ve watched op-eds fly across the interwebs, but with a certain amount of detachment. Gender issues aren’t anything that I get particularly worked up about. When I became Orthodox, I found the delineations between male and female roles and obligations refreshing. I don’t feel limited, second-class, subjugated or any of the other unfavorable adjectives I’ve heard describing women’s treatment in Orthodox Judaism. On the contrary. I feel that much of what I was taught about gender in my pre-Orthodox days was less healthy and less reasonable than what I understand the Torah to teach. This is probably why I don’t get worked up whenever a gender-related topic makes the rounds online. I’m happy with my paradigm. Partly, it was the intriguing email I received, describing the author, Miriam Kosman, as “a charedi (that’s Ultra-Orthodox) mother-of-11 from Bnei Brak who is also a scholar of feminism, currently studying for her Phd at Bar-Ilan University.” That got my attention. Here’s a woman who has been in both worlds, has read current literature in gender studies, but is also well-versed in Torah sources on gender roles. I was curious to see how she meshed these (potentially very) different sources of information. 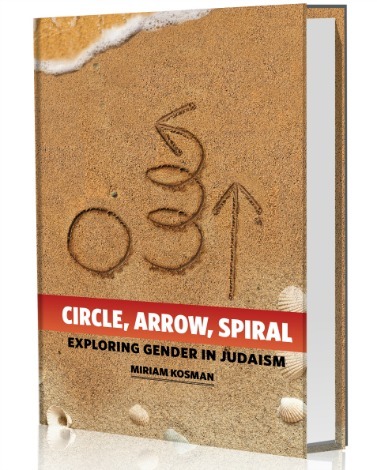 The book, Circle, Arrow, Spiral: Exploring Gender in Judaism, received positive reviews from not only prominent rabbis but also from those in the academic world. So that was interesting to me as well. Also, even though I’m very happy with my understanding of the Torah’s views on gender, it’s good to not become too complacent, and to continue to learn and study even topics that I don’t grapple with. And, wouldn’t you know, I found myself quoting the book while learning with my Partner in Torah, discussing it with my husband, and thinking about many of the topics that Kosman explores. Divided into two books, the first book contains five discrete sections, the second, three. Each section has at least a couple of chapters, and each chapter contains a short synopsis at the end, which I found very helpful. Kosman begins with defining the general male force, (arrow), the female force, (circle) and their synthesis (spiral), which is the Jewish ideal, the middle path. She delves deeply into what it means to be a giver (male) and receiver (female), addresses the differences in morning blessings (sometimes a point of discontent), brings the midrashic connection between women and the moon, and discusses the reality of how the world should be female-oriented, but very much runs in the male mode. That’s all in the first book. The second book takes a closer look at women in halachah (Jewish law), discussing such contentious issues such as who can serve as a witness, polygamy, the ketubah (wedding contract), the get (divorce contract), modesty, as well as roles in the public versus private sphere. That’s a lot of juicy topics in there. She closes with a fascinating three-chapter section titled “The Jew as the Prototype Female,” examining the relationship of the Jewish people to G-d. There is a lot of information packed into this book, and it would be excellent for studying with a partner. I almost wish that I hadn’t read it alone for this review, but had been able to study on a weekly basis over a longer period of time. As it was, it took me a while to get through it, as I wanted to savor the information, mull over what I had read before moving on to the next chapter. Even so, I feel that I didn’t retain as much as I would have had I studied with another person. In her explanations of differences between the genders, Kosman did not fall back on simplifications, and repeatedly acknowledged the reality that men have some female aspects, as women do male aspects, and in each person, the ratio of male-to-female tendencies will vary. I appreciated the nuance she brought to this discussion. I also found interesting the discussion of the general male and female energy in the world, and her observations that while the world is still mainly run according to male energy, the presence of female energy has been, and continues to, increase. Her discussions of the view of a women’s role in the past was also very intriguing. There are abundant footnotes that contain a wealth of information, fascinating stories, and more food for thought. The inclusion of footnotes definitely lends a more academic air to the book. While there are many concepts with which I was already familiar, I found some new and intriguing information on the Torah’s view of gender. This wasn’t a “oh, I’ve heard all this already” kind of read, but a book that I found deepened and expanded my understanding of Jewish thought on gender. This book is accessible to a wide spectrum of people, and is a must-read for anyone who is even remotely curious about what the Torah says about gender roles (and is even maybe a must-read for those who aren’t curious at all, like me). You can get the book here, or also at your local Jewish bookstore. You can download a free excerpt of the book at MiriamKosman.com. Have you read it? I’d love to hear your thoughts as well! I think you’d really enjoy it.